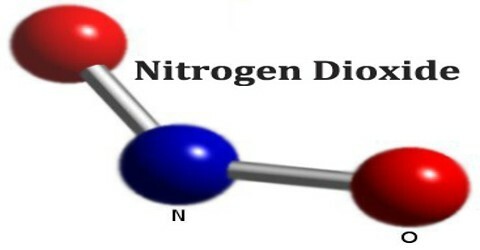 Nitrogen Dioxide (NO2) is a red-brown poisonous irritating gas that, at ordinary temperatures, exists in equilibrium with dinitrogen tetroxide. It is an intermediate in the manufacture of nitric acid, a nitrating agent, and also an oxidizer for rocket fuels. NO2 is an intermediate in the industrial synthesis of nitric acid, millions of tons of which are produced each year. At higher temperatures it is a reddish-brown gas that has a characteristic sharp, biting odor and is a prominent air pollutant. 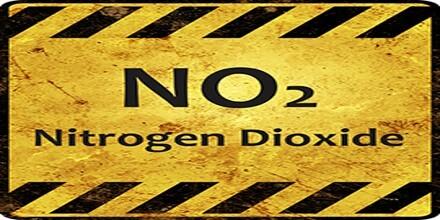 Nitrogen Dioxide (NO2) is an important air pollutant because it contributes to the formation of photochemical smog, which can have significant impacts on human health. 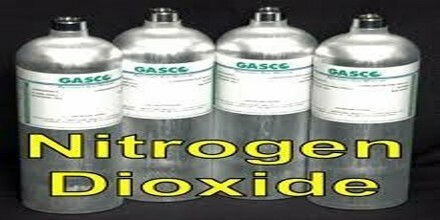 NO2 and other nitrogen oxides are also precursors for a number of harmful secondary air pollutants such as ozone and particulate matter, and play a role in the formation of acid rain. The major source of nitrogen dioxide is the burning of fossil fuels: coal, oil and gas. Most of the nitrogen dioxide comes from motor vehicle exhaust (about 80%). Other sources of nitrogen dioxide are petrol and metal refining, electricity generation from coal-fired power stations, other manufacturing industries and food processing. Nitrogen dioxide is a reddish brown gas or yellowish-brown liquid when cooled or compressed. Shipped as a liquefied gas under own vapor pressure. Toxic by inhalation (vapor) and skin absorption. Noncombustible, but accelerates the burning of combustible materials. Cylinders and ton containers may not be equipped with a safety relief device. 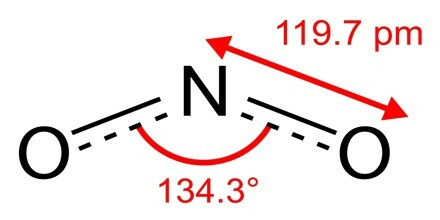 Unlike ozone, O3, the ground electronic state of nitrogen dioxide is a doublet state, since nitrogen has one unpaired electron, which decreases the alpha effect compared with nitrite and creates a weak bonding interaction with the oxygen lone pairs. Nitrogen dioxide is an effective insect attractant that can be employed in a variety of traps and forms, both alone and in combination with other attractants, and particularly is an effective attractant enhancer when used in combination with other attractants such as carbon dioxide, Octenol, heat, and/or light. It has been used as a catalyst in certain oxidation reactions; as an inhibitor to prevent polymerization of acrylates during distillation; as a nitrating agent for organic compounds; as a rocket fuel, a flour bleaching agent and in increasing the wet strength of paper. Reference: greenfacts.org, dictionary.com, environment.gov.au, wikipedia.